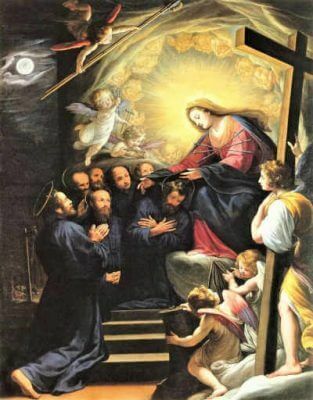 Seven Holy Founders of the Servite Order - My Catholic Life! There are many reasons to join a group. To quilt, play soccer, learn chess, travel, or meet new friends. We accomplish personal goals in a group that we would never accomplish alone. Groups create positive peer pressure for their members to show up on time, read the book, do the exercise, or complete the task assigned. When we join a group we are freely creating obligations for ourselves, because we know, deep down, that accountability to others encourages fidelity to our own obligations. The groups of the medieval world were called guilds. Craftsmen of similar skills and professions organized in guilds to learn, promote, and protect their trade. Guilds offered mutual assistance to their members that no individual could replicate. There was power in numbers. Today’s feast commemorates seven young men who belonged to a merchant guild in Florence, Italy, in the 1200s. These seven men were serious Christians. They loved God and the Church. And in addition to protecting their commercial interests by joining a guild, they also protected their souls by joining a local spiritual guild called the Confraternity of the Blessed Virgin, where their spiritual exercises were guided by a wise and educated priest who encouraged their devotion. After the members of the Confraternity experienced mystical visions of the Virgin Mary, there was nothing left to do except abandon their worldly concerns, set aside money for their families to live without their help, and flee the busy city for a solitary life in the nearby mountains. The Seven fasted, prayed, and lived lives of such extreme austerity that a visiting cardinal admonished them to stop living like dogs. Over time they adopted a rule, accepted new recruits, elected leaders, and spread throughout Italy and beyond. They eventually took the name of the Order of Servants of the Blessed Virgin Mary, also known as the Servants of Mary, or Servites. 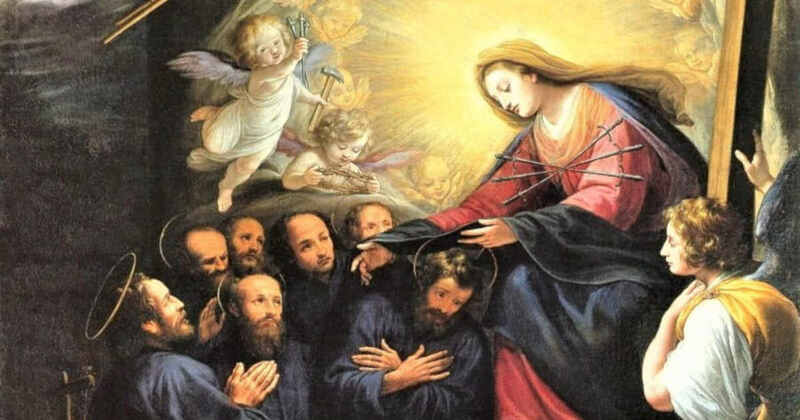 The Seven Holy Founders were especially devoted to the Seven Sorrows of Mary, and the Servites were instrumental in the Feast of Our Lady of Sorrows becoming part of the Church’s calendar on September 15. The Sorrows of Mary, the sword that pierced her heart, the tears she shed when witnessing Our Lord’s passion and death, motivated the Seven Holy Founders to promote devotion to Mary under this title. Mary was strong and stood at the foot of the cross. But she was also a mom who loved her boy. So she had a heavy heart that continually pondered what His suffering meant. We unite in joy at Christ’s resurrection on Easter and join with Mary’s sorrow just days before. The emotions of Scripture become the emotions of those who read it and those who live it in the liturgy and devotions of the Church. The names of the Seven Holy Founders are known. But the Church celebrates them as a group, with their individuality ceding to their group identity. Together they accomplished more than seven men working separately could ever have accomplished. Their confraternity became an Order, and that Order still exists for the mutual spiritual benefit of all, a theological guild holding its members to high standards of spiritual perfection. Servite priests and brothers are still active in various countries around the world, hundreds of years after the Order’s founding. This is a testament to the immovable, rock solid, foundation on which its Seven Holy Founders constructed their spiritual and theological home. On your feast day, our thoughts and prayers turn to you, the Seven Holy Founders of the Servite Order. Help us to find mutual support and assistance in loving God and Mary through a holy alliance with like-minded Christians. Through your intercession and example of group love of God, may our love for Him burn hotter and longer than a single flame.